Season of festivals started! variety of sweets are prepared for different festivals. First comes “Nagara Panchami” the day on which we perform Naga Devata Pooja offering Naivedyam to Naga devata. In some regions, people offer five types of sweets to Naga Devata apart from milk. They may be of different kind, out of them two dishes are common, those are “Tambittu” and “Chigali”. I have written about these two dishes in my earlier posts. This is the easy one I am bringing it for you. I tried to make it using very less quantity of ghee so that every one can enjoy this sweet and especially those who are weight conscious and it is very healthy and nutritious as well. Godi hittu is a kannada word used for wheat flour which is commonly used to make all types of rotis or breads. Varieties of sweet dishes can also be prepared by using wheat flour, this recipe is one of them. the best part is it requires no preparation and consumes very less time. Let’s see the preparation of delicious “Godi hittina unde”. Here, I am using only raisins and cashew nuts, you can add any dry fruits of your requirement and taste. Crush cashew nuts into small pieces and keep it aside along with raisins in a bowl. Place a small frying pan on medium heat, pour cardamom in it, roast them until they start spliting slightly. Remove from heat and make a fine powder of it and put it in a small cup. It enhances the taste and gives aromatic smell to the dish if you roast cardamom before making powder. Place a wide bottemed frying pan on high heat, pour 1/2 table spoon of ghee (clarified butter) in it. After 1 or 2 minutes, lower the heat and pour crushed dry fruits to it and roast them for 2 minutes. 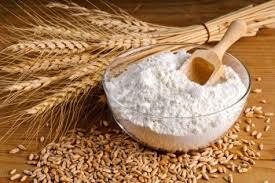 After 2 minutes pour cleaned wheat flour to it and roast it until it turns into slightly brown colour and starts leaving a pleasant aroma. It may take 10 minutes. Take it off from the heat and keep it aside. Place a frying pan (Kadhai) on medium heat. Pour 1/2 cup of water and crushed jaggery to it, stir it continuously so that jaggery should dessolve completely. It may take 5 minutes. Add remaining ghee (clarified butter) to it and stir it further for 1-2 minutes. Take it off from the heat and add cardamom powder to it and mix it, add roasted flour to it slowly and gradually. While adding the flour you have to stir continuous so that all ingredients should mix well. You will have to start making ladoos immediately. Initially, you may feel that stuff is dry, you need not worry. Loosen small portion of the stuff with hands and sprinkle few drops (say 1/4 tea spoon) of milk over it and mix it with fingers. By doing this, stuff will become soft and smooth for making unde (ladoos). Repeat the procedure for remaining stuff. You can store it for more than one month. Healthy, delicious and low fat Godi hittina unde (wheat flour roundel) is ready to serve. If you try it once, you would love to repeat it. Isn’t it amazing!